On my first visit to Switzerland I was struck by how close everything was. The towering peaks, the shimmering lakes and those architectural landmarks, all nestled together in the most dramatic scenery. 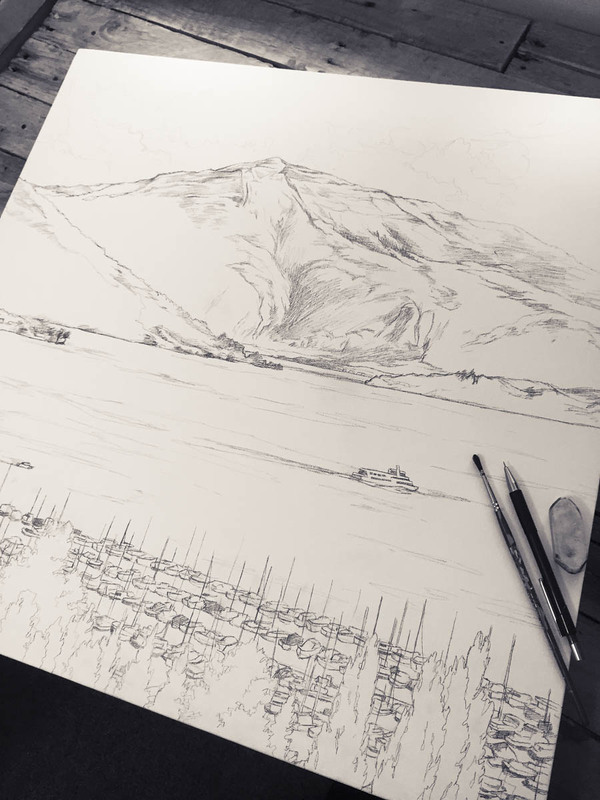 To capture the scale and the atmosphere of these evocative places felt like the perfect challenge for an artist. 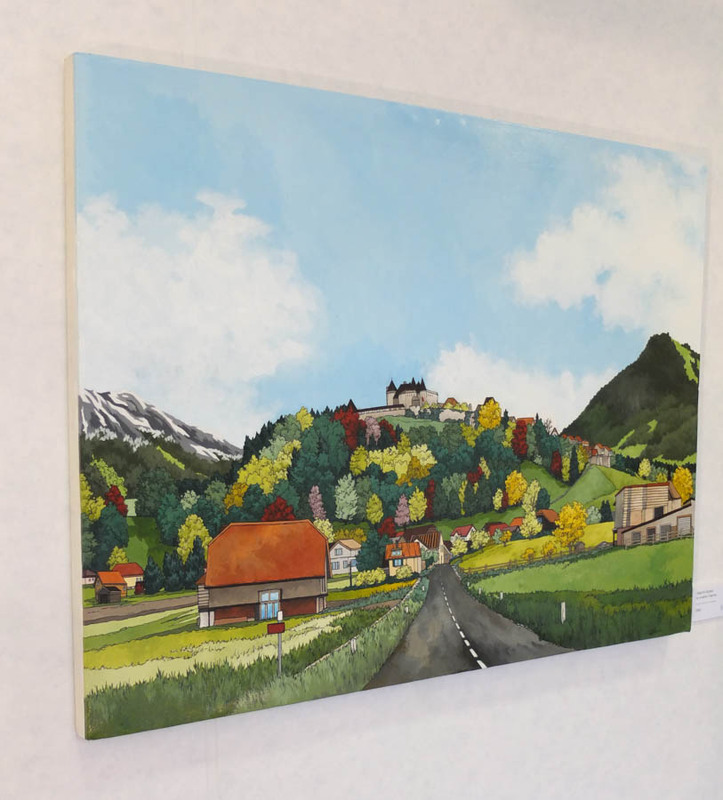 On this page I want to introduce you to a few of the illustrations I’ve created from my visits to Switzerland, and tell you a little about my next series of paintings. 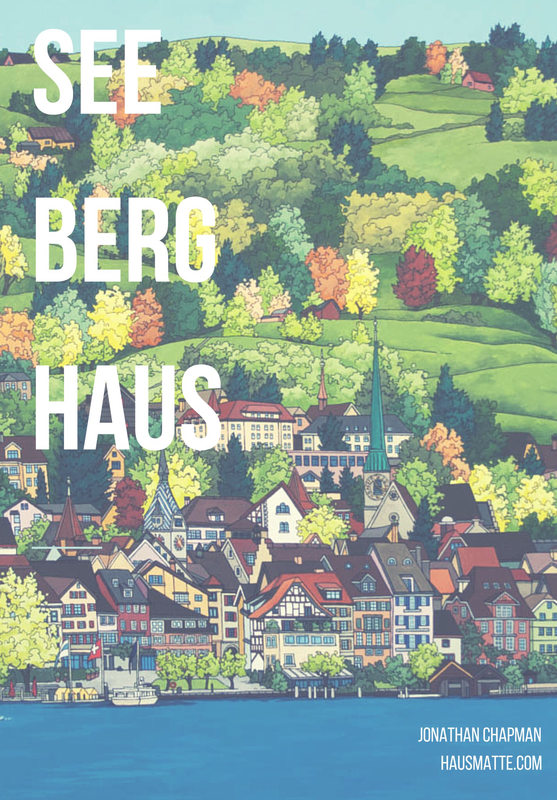 Collectively titled ‘See, Berg, Haus’, these works will further explore the relationship between Swiss places and their majestic landscapes. 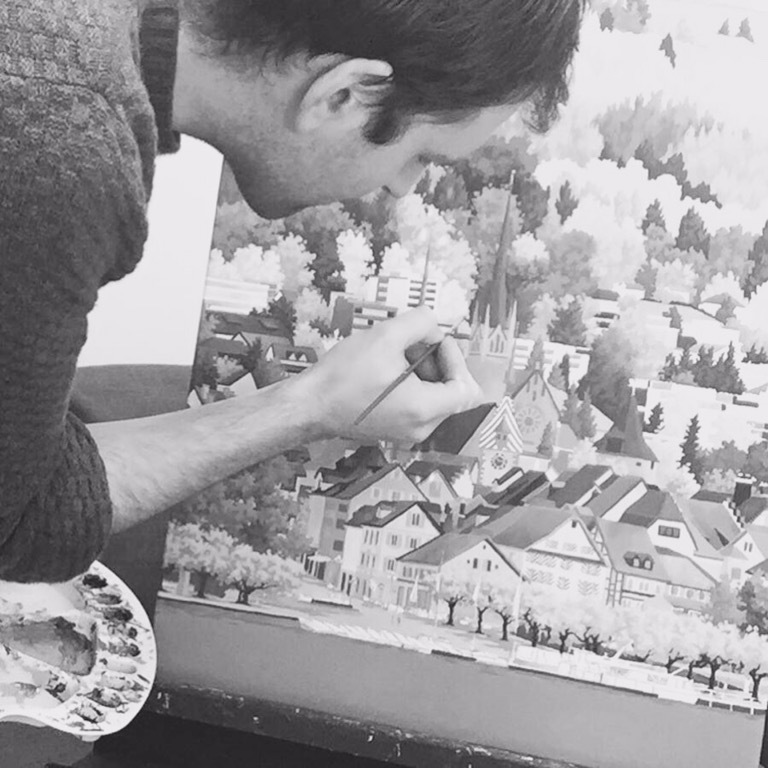 Switzerland’s distinctive atmosphere has drawn me back time and again, with every painting bringing a different adventure. After my first trip I had further invitations to visit the country, from friends, families and new acquaintances, who knew the landscape and had made it their home. Like me they wanted to capture the views they had grown to love, and their sense of connection to these special places, in original artwork for posterity. 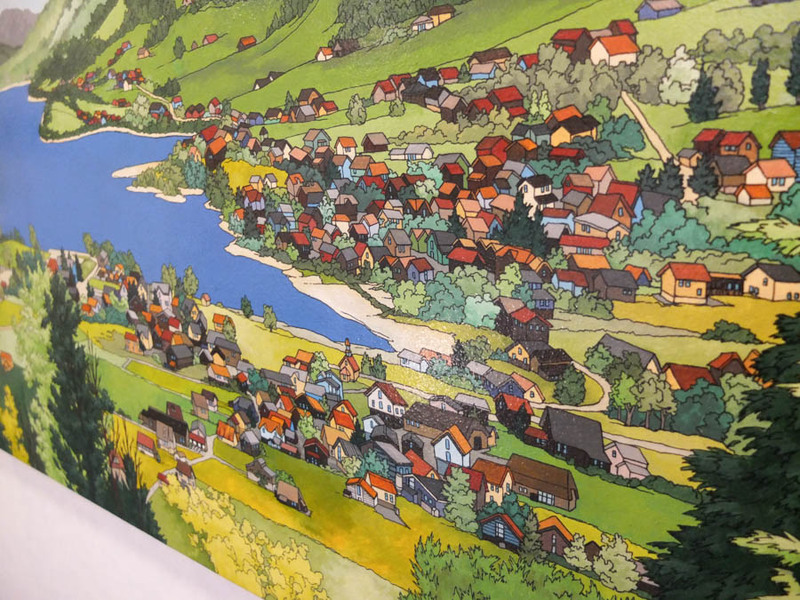 From Zürich, Zug and Luzern to Gruyere and Geneva, each location surprised me with its colour and detail. Joseph Mallord William Turner famously painted his ‘Blue Rigi, Sunrise’ from Luzern in 1842, after following a well-worn path that had brought many British people to Switzerland in the nineteenth century and earlier. Many artists and writers have since followed in his wake. 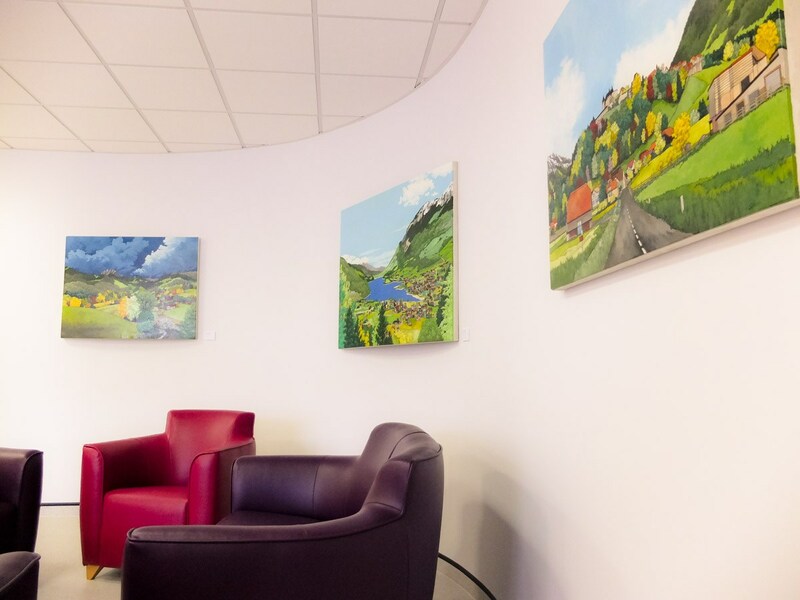 What is this special atmosphere that draws artists to Switzerland? That encourages families from all around the world to make this country their home. Certainly the spectacular views are one reason. 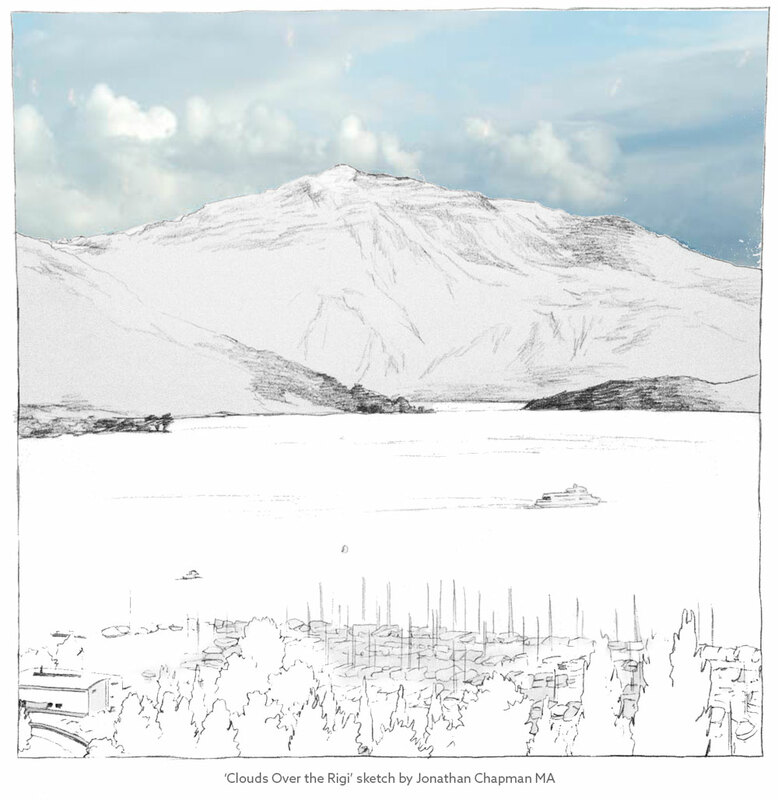 Rigi, the ‘Queen of the Mountains’, is a majestic monument that has captivated many artists in addition to Turner. 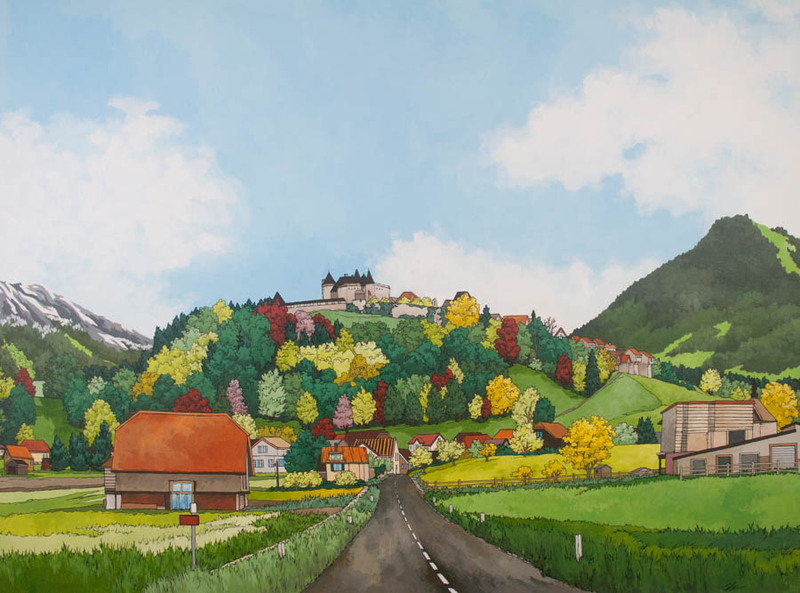 For me, however, I think there is something else in the Swiss landscape that engages us. Like the best works of art there is an inherent conflict: A landscape that is both dramatic and tranquil. Moody and invigorating. Excitable and calming. Can such feelings ever be communicated in a painting? My latest explorations will take a meandering trail between Zürich and Luzern, with a particular focus on Zug. Both as a town and a canton, Zug is historic with its own modern contradictions. It feels simultaneously old and new. The headquarters of global industry leaders sit alongside independent craft shops, thirteenth century architecture and fields managed by fifth-generation family farmers. Modern flats nestle next to traditional Swiss houses, providing homes for people who come from Zug, elsewhere in Switzerland or across the world. All of them attracted to this unique place. I want my paintings to reflect these contemporary contradictions, bringing the modern society together with the carved ornamental facades of the past. 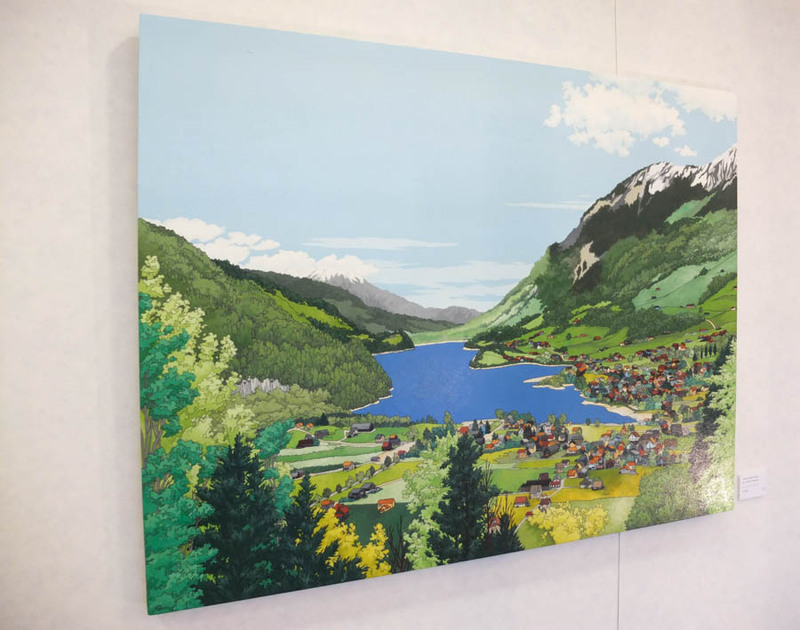 Zug town itself also sits with a perfect view of Rigi, that one immovable object that remains as consistent today as it did when Turner gazed upon it over 150 years ago. Jonathan Chapman is a professional artist working with big colours and fine details. 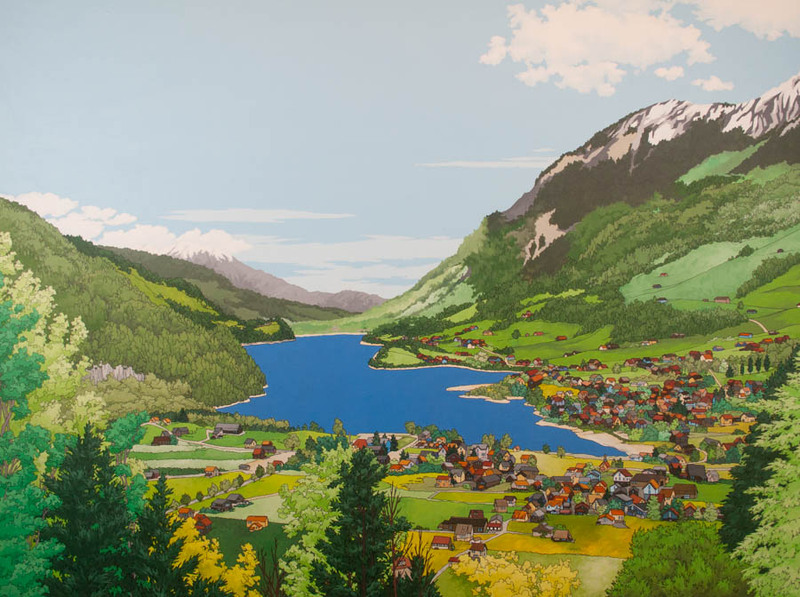 Inspired by the Swiss environment and its inhabitants, Jonathan has already painted several works capturing the country’s scenery. His latest ongoing project, collectively titled ‘See, Berg, Haus’, explores further the relationship between Swiss habitats and their landscapes. Jonathan is also available to discuss future works, whether large or small, personal or communal, with those who share his love of the country’s evolving and evocative landscape. 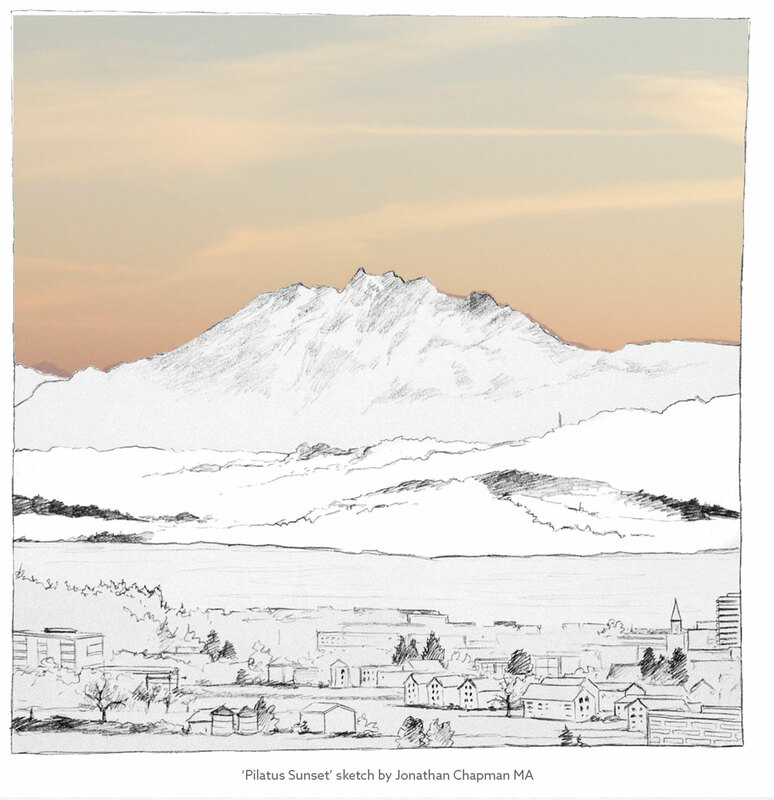 Jonathan is represented in Switzerland by Hausmatte. Please contact alex@hausmatte.com to learn more about buying or commissioning original works of art.